The first election of a West Midlands Mayor on 4th May 2017 is a historic moment for the region. Make sure you exercise your right to vote and have your say on who should lead and champion our region. This website offers an introduction to everything you need to know about the election, including the candidates, who can vote and what the Metro Mayor can actually do including their powers and responsibilities. All of the leading five candidates appeared at four Public Debates across the West Midlands in the lead up to the election of the first West Midlands Mayor on 4th May 2017. Councillor James Burn (Green), Pete Durnell (Ukip), Beverley Nielsen (LibDem), Siôn Simon MEP (Labour) and Andy Street CBE (Conservative) appeared on stage together for the events which started on 7th March. Meet all of the candidates here. The Public Debates were led by local newspapers across the region: the Express & Star, Birmingham Mail and Coventry Telegraph. The papers were responsible for selecting members of the public to attend the Public Debates and put their questions to the candidates. Reviews of each Public Debate can be found in this section. The Public Debates were kindly supported by a range of partners – see them all here. 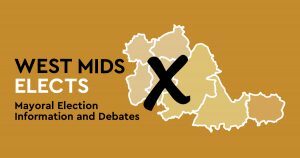 Beyond the audiences at the four West Mids Elects events, we encouraged audience members and voters to engage in the Public Debates through social media, using the hashtag #wmmayor and via our Twitter handle @westmidselects.